The loss of an a.m. hour in the coming week will have many workers feeling a bit vague. But there are ways to compensate. Might want to make sure your car insurance is paid off by Sunday—in case you forgot, that’s when we lose a morning hour thanks to the switch to daylight saving time. The change affects the body and brain in myriad ways in the ensuing days and has often been blamed for an uptick in car accidents. Luckily, a sleep researcher and a productivity expert weighed in on successful strategies for avoiding walking into walls at work next week. That and more in this week’s “HR Buzz,” featuring the latest workplace trends, surveys, and reports. Forty percent of employers are looking to hire full-time workers this year and 47 percent will be seeking part-timers. Meanwhile, 32 percent of workers are looking for a change in 2019. That’s the word from job site and HR technology provider CareerBuilder’s annual hiring survey. 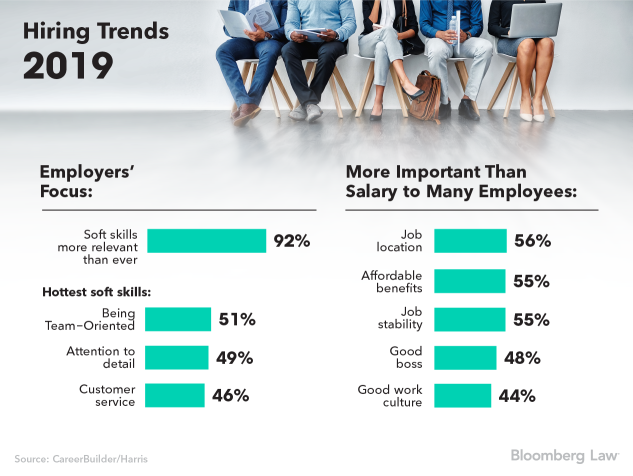 Training, soft skills, and creating a good job-search experience will be major themes this year, a Harris poll of 1,021 hiring managers and HR managers and 1,010 full-time workers indicates. Companies are taking a close look at diamonds in the rough, whether on staff already or in the job candidates realm. Some 59 percent of employers said they would train and hire workers who aren’t 100 percent qualified but show promise. Fifty-six percent of employer respondents said they’ve paid for employees to be trained off-site. Confoundingly perhaps, 66 percent of employee respondents said their employers don’t offer such training. Meanwhile, soft skills, including communication abilities and critical thinking skills, will give candidates who have them an edge this year, the survey showed. Where employers are hiring this year: jobs tied to skilled labor (25 percent); data analysis (21 percent); digital marketing (12 percent); cybersecurity (11 percent); AI and machine-learning (10 percent); and healthy living (10 percent). Rest assured you’re not the only employee who forgot one of your multiple passwords again or was it your pin this time (or maybe both)? And by the way, you’re most likely to be asking for IT help on a Monday or Tuesday morning, according to corporate software provider Spoke, based in San Francisco. The company’s mission is to get its clients’ employees the various types of information they need quickly and without a lot of redundancy on the part of the information providers—who could reside in any of a company’s divisions. It can centralize information across divisions—Emily Wang, Spoke’s head of product, used the metaphor of its system being the “connective tissue” that gets everyone on the same page speaking the same language. Spoke recently crunched a lot of its data to report on some fun and illuminating facts about employee requests. First off, you know who you are: Twenty percent of employees are responsible for 80 percent of the questions. Almost half (49 percent) of HR requests are repetitive, but just 14.5 percent of IT requests are. HR requests tend to occur later in the day, peaking at both 1:00 p.m. and 9:00 p.m. (when things are calming down for the evening at home and the kids are in bed, Spoke surmises). Employees want their searches for help and information to be as easy and transparent as ordering a ride from Uber, Wang told Bloomberg Law. They also want to communicate via the route they’re most comfortable with, whether that’s text, email, web app, or other link on the company platform provider. It’s that time of year again—U.S. clocks jump ahead an hour this Sunday at 2:00 a.m. The sudden landing of daylight saving time means many of us will be tired, grouchy, and possibly late this Monday morning—even more than usual. The digital alarm may pretend it’s your normal wake-up time, but the body knows better. So be kind to yourself and your co-workers if some of us seem a little off. What to do? Be aware of the effects on your mind and body—and go to bed half an hour earlier (not more, it could give you insomnia) in the days before the change, Dr. Azizi Seixas, assistant professor at NYU School of Medicine’s Department of Population Health, told Bloomberg Law. We caught Seixas as he finished up two fully packed workshops on the subject hosted by NYU Langone Health’s LiveSmart LifeStyle program. The sleep shorting causes short-term memory lapses, and difficulty concentrating and doing complex analyses. And that can lead to injuries, mistakes, and diminished quality of work. The change can be especially dangerous for some types of worker, such as those operating heavy machinery, he said, noting that studies have shown an increase in automobile accidents in the days following the time change. Productivity and leadership coach Ellen Faye says a little planning can help a lot and aiding employees with the challenges of the change is a good opportunity for managers to demonstrate leadership. It sounds obvious but one simple thing to do is put the change on your calendar now and remind yourself to change any clocks that don’t do it automatically, she says. It’s a no brainer but people forget and that can cause confusion and missed meetings later. She advises people who are “‘body clock’ sensitive” to schedule an easy Monday if possible and use the post-change Monday for less challenging tasks. Use the day to clean your desk or organize your to-do list. “It’s a good excuse to regroup,” said Faye, a past national president of the National Association of Productivity and Organizing Professionals. If you’re the boss, says Seixas, don’t schedule two-hour meetings. Keep any meetings short and preferably standing. Employees can also perk up by taking short walks, especially outside. And if you’re starting to hallucinate Hostess cupcakes and other bad carbs, don’t worry, it’s only natural. The average person loses about 40 minutes of sleep Sunday night, which throws off your leptin and ghrelin levels, the hormones that control hunger. Check back Fridays to get your latest HR Buzz.